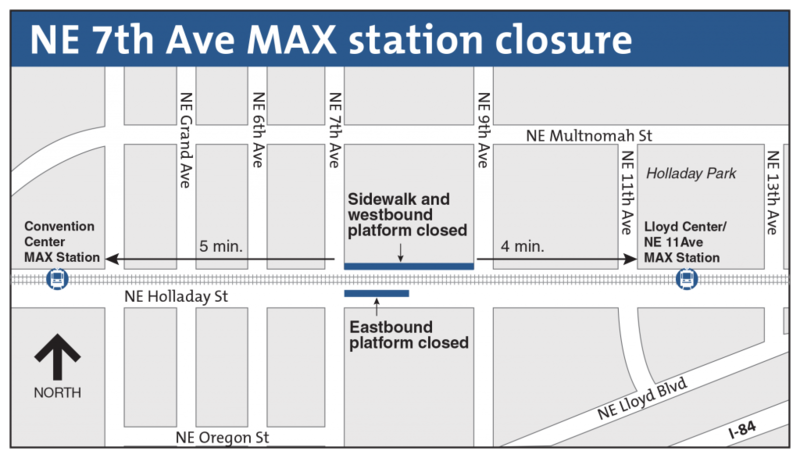 The NE 7th Ave MAX Station in Portland’s Lloyd District will need to close for approximately a year due to a multi-story apartment building being constructed next to the station. The closure of the station as well as the city sidewalk on the north side of Holladay Street between 7th and 9th avenues will begin Monday, March 31. Both are expected to reopen in spring 2015. Turner Construction Company is erecting the “Hassalo on Eighth” multi-story apartments to the north of Holladay Street. The next phase of construction will occur right up to the sidewalk adjacent to our westbound platform. The contractor requested that we close the station in light of construction that will take place in this next phase of the project. Both platforms will be closed. During the closure, riders can use the Lloyd Center/NE 11th Avenue stop, a four-minute walk from 7th Avenue, or the Convention Center stop, which is a five-minute walk from 7th Avenue. More than 3,700 riders use the 7th Avenue Station. While we regret the inconvenience to riders, the contractor determined closure is necessary to ensure safety during this phase of the project. TriMet’s Trip Planner and Transit Tracker will reflect the closure of both platforms, but due to technical reasons both tools will show the stops (IDs 8342 and 8375) being closed on Sunday, March 30 as well. Digital displays at the station will indicate the stops are open and being served for that day only. The construction work will not block MAX trains running through the area. As the construction progresses, please visit our NE 7th Ave Station closure web page to learn about any updates to the project and how it will affect TriMet service.